MSI has updated their netbook line once again. While the U130 and U135 already packed Intel's latest Pine Trail processor, the U160 is throwing down the battery gauntlet. Fifteen hours on one charge? That's nuts. Of course, it's not really fifteen hours, since actual battery life is never anywhere close to listed. And the claim only applies to when the netbook is in "Eco" mode, which undoubtedly requires a significant performance trade-off. But even if the U160 can achieve 60% of its claim during normal usage, that's as impressive a netbook battery life as we've seen. 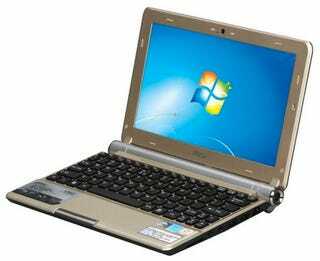 The $380 price tag also includes a 10-inch LED display (1024x600), the Pine Trail's standard 1GB RAM, and and Windows 7 Starter. But you'll have to make do with a 160GB HD and an island-style keyboard, which on a netbook doesn't leave a lot of room for error. But—especially if the battery life claim holds up—you could certainly do worse for more money. CITY OF INDUSTRY, CA – March 08, 2010 – MSI Computer, a leading manufacturer of computer hardware products and solutions, is proud to announce the availability of the 2010 iF Product Design Award Winning Wind U160. The U160, MSI's second netbook to feature the new Pine Trail platform, is powered by the Intel® Atom N450™ Processor. The incredibly efficient and Energy Star compliant U160 boosts a 15 hour battery life when running in MSI's exclusive ECO mode. This allows users to get through a full day of work or school without having to bring their adapter. Abandoning the traditional clamshell form, the Wind U160 ushers in a new era of netbook design. From the illuminated MSI logo on the netbook's outer surface to the power button placed on the U160's cylindrical hinge, the newest Wind model sports a slim new footprint. Just 0.98 inches at its widest point, the U160 is the thinnest Wind model to date. The units' raised chiclet keyboard and seamless wide touchpad increase both accuracy and comfort while typing. The U160 is available in a fashionable sparkling gold or a more formal black, and its Color Film Print finish gives it a sleek stylish new look. The newest edition to the Wind family will also ships with 10-inch backlit LED display, 1 GB of DDR2 memory, a 160GB hard drive, a 6-cell battery, Bluetooth connectivity and Microsoft's Windows 7 Starter. MSI also included its user friendly EasyFace facial recognition security software to help U160 users protect their information. The MSI Wind U160 costs just $379.99 and is available now at Fry's (Fry's product number L1600) and online at Newegg and Buy.com.